The easiest way to reach me is by email to bfields at fieldses.org. I maintain the Linux kernel's NFS server, and work on NFS problems, at Red Hat. Before mid-July 2010, I worked at the University of Michigan's Center for Information Technology Integration (CITI), on a variety of projects, mainly having to do with NFS version 4. I have some notes on the linux kernel (work in progress). I received my PhD in 2000 from the Math Department at the University of Michigan. My dissertation was written under the direction of Mel Hochster, and is a study of the lengths of modules determined by killing powers of several ideals of a local ring, as a function of the exponents; download a copy of my thesis here. Also available is a pdf of a Journal of Algebra article based on the thesis, which covers the same material but with some improved proofs. I like playing music with people, including The Roundabouts and Funk Opus. I play bass guitar, piano, and saw, and sing a bit. 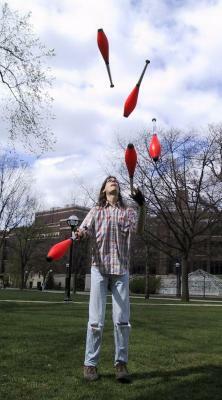 I juggle with the Ann Arbor juggling club, and used to help organize our juggling festival. I've served on the board of the Washtenaw Bicycling and Walking Coalition. I used to help out with Arbor Update, which has been on haitus since 2010. The associate pastor (who also juggles). I am, however, the only Bruce Fields with a Teeter Talk interview. I kept it elsewhere until May 2005.
rfc 2623 - v2/3 sec.